Crossole is a musical meta-instrument that allows you to switch the level of controlling music. The word “Crossole” is a portmanteau of “crossword” and “so-lee(소리)” which, in Korean, means sound. Literally, Crossole is a crossword of sound. 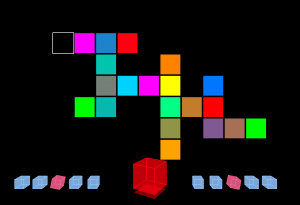 Chord progression of music is visually presented as a set of virtual blocks that will eventually start to resemble a crossword puzzle. With the aid of the Kinect sensing technology, you can either build music in high level by gestures of building a score(blocks) as well as you can play note by note by stepping into the low level(grid). In the way that a Crossole player build musical structure using a set of blocks and play music by moving a cursor within the blocks, you have to think about the musical structure prior to notes, melody or sounds. Variation in progression of music can be easily made by selecting a different route. Also, Crossole let you save your route. Once you finish the recording, you can let Crossole replay music by traversing the recorded route in the background. In the meantime, the player can map his hand gestures to other interesting sound. Crossole: A Gestural Interface for Composition, Improvisation and Performance using Kinect (paper). Sertan Şentürk, Sang Won Lee, Avinash Sastry, Anosh Daruwalla, Gil Weinberg. 2011 Listening Machines @ Georgia Tech. bitwise comparison or calculation -> beat transformation. 7 -> 00000111 -> patterns. 2. movie as a palette, color as sound source, dynamic sound space, expressivity left to the player.